Here's a few pix of fitting anti-tramps bars. This set for the Ecoboost Plus 4 prototype (Possum)supplied by New Elms (Rutherford Engineering). Beautifully made and anodised with machined stainless steel spring plates which are a work of art. Good fitting instructions but there are various ways to skin a feline. I found it easier to simply jack up one side of the axle then the other to insert the wooden blocks between spring and chassis rather than get heavy people to stand in the car. This gives ample room to get at the U bolts and change the spring plates. Removing the blocks is then simply a case of using the trolley jack each side again. 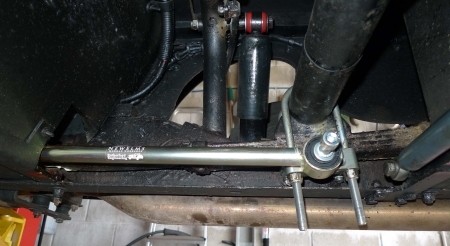 Similarly, rather than removing the front spring shackle pins to install the longer ones supplied it is easier to use the new pins to carefully drift the old ones out (reversing the pin so the bolt head is on the outside and the nut on the inside). This avoids the nightmare of trying to precisely line up the spring, spacer and chassis to get the new pins in. On the plus 4 GDI Mr Morgan has already made a cutout in the bulkhead on the offside for the Tramp bar so only the nearside has to be cut. Pix show the spring plate (with four alternative bolt holes) and the bar in place. Final adjustment has to be done with axle stands supporting the car to simulate a loaded condition. The outside u-bolts can be trimmed with an angle grinder after fitting but the inside ones must be carefully measured and cut before assembly. Having the seats out (I found £2 underneath) is a good opportunity to treat the floor with Danish Oil. With this car now producing more torque than the roadster I considered tramp bars were a necessity -- particularly after seeing that German U-Tube film of spring deflection with and without bars.